Thank you for taking this fourth Newsletter from The Crime Prevention Website , and Happy New Year! We’ve been a little timelier with this one, mainly because we wanted to get it out to you at the beginning of the year, but also to give us an early opportunity to say thank you for supporting us during 2012. If your friends, colleagues, family members and acquaintances would like to receive the Newsletter hot off the press then please ask them to sign up for it at this link If you write a Newsletter for Neighbourhood Watch or you run a website then do feel free to use the content of this letter with the usual acknowledgements. As of 7 th January 2013 (a full 9 months since launch) we’d received 37,800 visits and had 103.500 page views, so we cracked open a little bottle of Cava. Our goal to exceed 40,000 visits and 120,000 page views in the first 12 months still seems to be on target. So thank you to all of you who’ve promoted the site – it’s really appreciated. Once again we have not been approaching too many other websites for reciprocal links, because we’ve been busy setting up some new stuff for the New Year, but we have nevertheless added a couple more websites to our list of Partners. We are particularly pleased to have visitors from partnering websites as they spend twice as long on our site than other visitors and read twice as many pages. So it’s Hello to Fenny Compton Neighbourhood Watch in Warwickshire, Canterbury and District Neighbourhood Watch in Kent and the Thames Valley Neighbourhood Watch Association , which covers Berkshire, Buckinghamshire and Oxfordshire. The Community Websites for Camberley and Virginia Waters in Surrey have also joined us. These five NHW/Community Website partners are links 26 to 30, which puts us well onto our goal of 40 links in this category by April. Discount Locksmiths from Essex have linked to us for our guidance on ‘Insurance Requirements’, which we don’t mind, because all traffic being referred to us is good traffic! A professor colleague of mine, Paul Cozens, who emigrated to Australia a few years ago, has linked up from his university’s Design out Crime Research Centre – thanks Paul! A Tweet reference from our story about Pedlars Certificates got posted onto the discussion board of Sheffield’s Star newspaper at the end of November, which resulted in a rather large spike in visitor numbers for about three days. This one was preceded by Rods ‘n’ Sods who sent over a fair few more visitors (and still is) after this site was promoted by one of our supporters. And then with some delight the first of several (we hope) Police and Crime Commissioners (PCC) linked to us. The first was the PCC for Humberside , Michael Grove and the second is the PCC for Cheshire , John Dwyer. Obviously and quite rightly both will link their visitors to their own police service advice pages, but it’s great to be included as a trusted reference for that ‘extra’ bit of help. This category includes Chough Martial Arts in Haverfordwest. Chough Martial Arts is a not for profit club which aims to promote self protection through the study of Ju-Jitsu and wider martial art concepts in an open way for the benefit of its members. We learnt this in the police and I thoroughly recommend the art. In December I had a call from BM TRADA , one of the biggest certification bodies in the UK. (These are the people who will test (through their test house, Chiltern Dynamics) and certify products such as enhanced secure doors and windows that I keep on about). Their representative called me to see if I would like a reciprocal link in place with them. Well, of course, this site already links to them so you can do your own checks on companies supplying doors and windows, but obviously it will be great to have a link going from them to us as well! So now I’m waiting for some new stuff to be sent to me so that I might update the information. Being linked to by a world leading certification body is a big step forward for us, because it means that they like what we say and that gives us a little bit more credibility. Thanks BM TRADA! Here’s our Google.co.uk ranked position for some other searched words as of 7 th January 2013: All these positions have been slowly improving over the months and we are very grateful to you for helping us make the grade. Lots of minor updates to pages have been made as usual, but one of the biggest tasks was to find and put in place all the new Police and Crime Commissioner Website addresses. You’ll find them on Police / Police and Crime Commissioners Websites . This took ages to do and wasn’t helped by the slowness of some of the PCCs to get their websites up and running. They’re all there now, so happy surfing. The huge surge of visitors from the Pistonhead Community has now waned somewhat (although referrals are still coming through) and the number of completed home security surveys has now surpassed 1,000 and stands at 1,031 as of 7 th January 2013. The ‘average’ score has fallen again to 60.46 out of 100, which is rather uncanny (and lucky) as I tried very hard to have 60 as the average score from the outset during testing. I said last time that I was going to look at windows this time round, but circumstances have caused me to postpone that until Newsletter 5 and so this time I’m keeping it simple and re-examining some findings published in Newsletter Number 1. I think the findings ably demonstrate the fact that you need a large sample before anything meaningful can be gleaned from the survey figures and I’ve no doubt that the survey findings will alter again (slightly) once I’ve hit 2,000 surveys later this year. When we launched this site a lot of the people surveying their homes were from the Neighbourhood Watch fraternity (and still are) and so in the early days I expected the findings to indicate a pretty good level of home security. Nine months on and the ‘neighbourhood watch type person’ has become a smaller share of the 1,031 people who’ve completed the survey. So, let’s take a look at the results, which I now think provide us with a more accurate measure of where the ‘average’ person is with their home security. These first two questions were asked so that I could get a gauge on whether people were overestimating their home security strengths, which they were back in June and still are today, but with some notable changes in the recorded responses. The following questions are really easy to understand and the results need little explanation: Anything that’s in green are the figures from the survey findings in June. Aside from the fact that some people could have a clear glass window next to the front door and use that for viewing the caller, I would have guessed a ‘yes’ figure more like 75%, so how wrong was I? Not a bad result, because not all people are chain people anyway; some will simply keep the door closed and shout through the door or a nearby window when answering the door to a caller. If you’re writing a Neighbourhood Watch Newsletter at the moment it might be worth highlighting these findings. It’s very easy to convert a manually switched light to an automatic one and 31.4% for manual switching is a surprisingly high figure and so is the 17% who don’t even have a light! Likewise, not having auto switching for some internal lights is easily remedied with a few timers. Take a look at this link . The 38.1% is not a good finding! Not only can these people lose property from the shed, but they could also have the contents used to break into the house. Remember that burglars will often ‘travel light’, i.e. they’ll take very small house-breaking implements with them, but take advantage of what they find in someone’s garden or in the shed, such as a spade. A comparison with the June figure for ‘yes ‘clearly indicates that a non Neighbourhood Watch person, not familiar with property marking, is now filling out the survey form. Another one for your newsletter, because most cars are stolen using keys these days and changing all your door locks can be expensive! Safes are not as expensive as you may think. Take a look at safes at this link . 90% stated that were likely, very likely or extremely likely to recommend this website to others. We’ve posted quite a lot of news items onto our news blog these past few weeks and rather than regurgitate the detail again in this Newsletter I’ve provided the headlines and links to just a few that attracted the most comment. Please copy and paste into your newsletters as you see fit, but do show the origin and original authors. November kicked off with a story about government plans to reduce public spending on the police service and the ‘crime prevention’ budget for things like CCTV, better street lighting and police visits to schools. This story got quite a reaction – unsurprisingly! Nice story this, featuring Police Community Support Officer Neil Spring who had himself filmed nicking his own bike from a busy set of cycle stands somewhere in Bristol. In the film, which is available on You Tube at this link you can see several members of the public looking on while he uses a couple of bolt croppers and or brute force to take four bikes. Watch the video to see how many people called the police! On the run-up to the PCC elections on 15 th November I ran a countdown on an almost daily basis and it seems that the experts who said that there would be a low turnout were proved correct. I like to think, of course, that one or two people read my messages and did vote! Details of all the PCCs and their websites can be found at this link I have written to some of the PCCs to see if they would entertain a reciprocal link. Thus far two have linked up, the PCCs for Humberside and Cheshire, and I’m very grateful. I had some very positive feedback for my shopping crime prevention tips and I know that some Neighbourhood Watches used the info for their own newsletters, which is what this stuff is for. Of course, the advice is useful for any shopping trip and several of the NHWs said so. The beginning of December saw cash payments for scrap metal being banned; a lot earlier than most of us had expected, and somewhat surprisingly this news item became one of the most read of the month. A Dad concerned at Christmas? My most read news item in December was some guidance I put together for young people going out on the town over Christmas. Once again this sort of advice is good for all occasions and I had plenty of thumbs up for it from my two sons and their mates! And finally, some information from insurer LV= was published at the beginning of January concerning the black market for stolen bikes. This gave me an opportunity to ‘dis’ those who knowingly buy stolen bikes and once again point people to the bicycle security advice on the website. Don’t forget that bike thieving is one of the few crime categories going up. 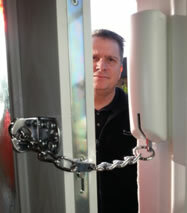 Just before Christmas I had one of those Chain Reaction DNA Security Chain Alarms installed to my new PAS 24 enhanced security front door. This is something I’ve been advertising on the website for quite some time and, what with one thing or another, it just took me an age to get one for myself. Well, I have now, and I must say I am dead pleased with the result. First of all, even though I’m big and ugly enough to scare away the majority of potential offenders at the door (see photo below) I have always used a door chain late at night; not so much for me, but to get my family into the habit of using it when I’m not around. It’s always been one of those ‘you know it makes sense’ things. I found out about the product originally about three years ago, when I was working for the Association of Chief Police Officer’s Secured by Design Project (ACPO SBD). The inventor, Rob Simpson, had approached ACPO about gaining ‘police approval’ for the product and consequently I found out all about it when I went to meet him. In essence, the product is three things in one. 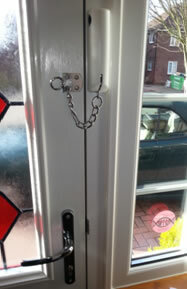 First of all, it’s a useful door chain, which can provide you with some extra control over the door opening and the caller. Secondly and thirdly, should the worst thing happen and the caller attempt to force the door, the inbuilt high decibel alarm will sound to alert the neighbours and perhaps a passersby and simultaneously the attacker and their clothes gets sprayed with a DNA marker. 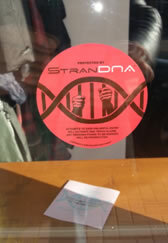 The DNA marker is unique to your address and in the event that the alarm is activated and the police arrest a suspect at a later time the suspect’s clothes can be forensically examined to find the DNA trace. The police can then use this evidence to place the suspect at the scene of the crime, thereby hugely increasing the chances of prosecution. 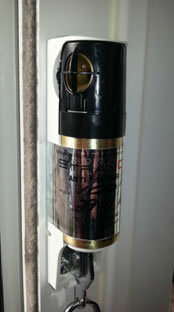 There’s a crime prevention element to the product as well, because the kit comes complete with a couple of window stickers to position near your front door and elsewhere around your home to warn would-be thieves of the installation. And you can also install additional devices to the other doors in your property, something that would be useful should the burglars pay you a visit and force the back door. I wasn’t quite sure how the thing would look on my door and doorframe, but as the photos confirm, it was a neat installation and is not at all obtrusive. It was quick and easy to install as well, something that the average DIY person could easily achieve, although for the time being it has to be installed by authorised fitters to satisfy ACPO requirements regarding the DNA evidence trail (I assume). But, having seen the complete installation from start to finish, including the evidential aspects, I’m sure a secure process could be developed to allow a DIY installation. This would help keep the cost down for the consumer and make this valuable addition to the home security arsenal even more available. All in all, I was very impressed with the manufacturing quality of the product, its design and installation and I can see why it has gained ACPO approval. And if the police like it then I have no hesitation in recommending this Chain Reaction DNA Security Chain to you. Well, apart from a small rise in domestic burglary near where I live it was a pretty uneventful Christmas period, crime-wise. That said, I heard reports of a couple door wreaths (£50 a pop) and a set of Christmas lights going missing during the build up and someone lost a potted Christmas tree from a front garden on Christmas Eve. There was also a sighting of a bearded guy in a red coat walking across a rooftop, but apart from that, all seemed fairly “good will to all men”, but I do wonder how much the appalling wet and windy weather helped! 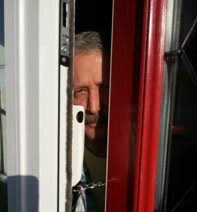 As we return to work and many of our homes become unoccupied during the day again our crime risks will start to rise. So now is the time to start worrying about the new 3D, HD TV on the wall and the new jewellery in the bedroom and all those new gadgets and what you can do to protect them. So, do please encourage your friends, relatives and neighbours to start the New Year off by carrying out a Home Security Survey on the Crime Prevention Website. I knew a petty burglar who fell into a cement mixer and became a hardened criminal. The same guy took a shower at the scene of the crime so he could make a clean getaway, but when he got caught all he wanted was measles - so he could break out. ...and have a great New Year!